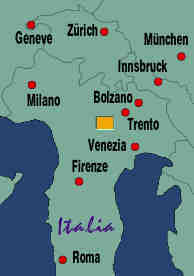 The map on the left is a detail of the Italy map on the right, of the yellow rectangle southwest of Trento. Tunnels are marked in yellow; the abandoned road mentioned below is marked in purple. Lake Garda is also in northern Italy, southwest of the Dolomites and in the southern end of the Alps. 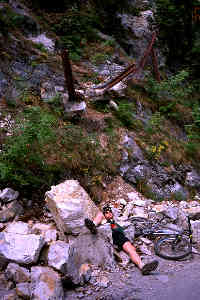 There is a variety of mountains, none as high as in the central Alps but all challenging to ride, and more accessible. We stayed in Riva del Garda, a town at the northwestern tip of Lake Garda. The Lira was weak at the time, so we went to the best hotel of Riva (the Hotel du lac et du parc) and rented a bungalow in a park at the edge of the lake. The picture at the top of this page shows the view from the abandoned road as it switches back and forth up the hill. Parts of Riva can be seen in the center. 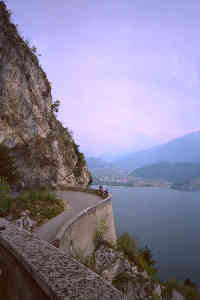 The road is very scenic with many views over Lake Garda, and has absolutely no traffic other than other cyclists, some of whom even pay attention to other cyclists going the other way. 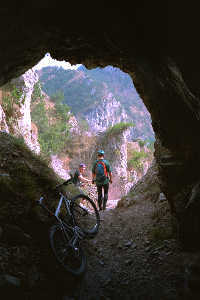 The abandoned road ends at a regular road, near a tunnel entrance whose ventilation can be heard from a kilometer off. There is much traffic on the way to Lago di Ledro. There are two ways to Monte Tremalzo here: a short one by following a switchback around a bad restaurant at a parking lot just before the lake, or going straight alongside the lake, through Bezacca and Tiarno, and turning left near Laghetto d'Ampola. 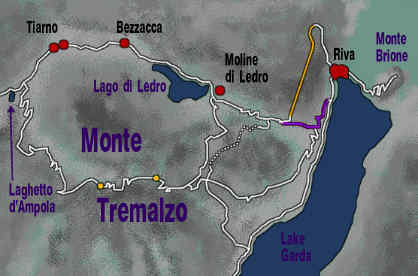 The first climbs Monte Tremalzo from the north, the second from the west. We did both, on different days. The second has more to offer, but also includes more riding on roads with car traffic. In April 1995, there was still snow on Monte Tremalzo. The first stretch of our climb from the west (first route) was on roads, but we turned onto off-road trails whenever possible and eventually left the road completely. The picture on the far left shows me crossing a shallow creek with a waterfall. Well, actually I had to repeat the performance to have the picture taken. There are many trails on Monte Tremalzo, more than I can list in my map; we used a KOMPASS map, 1:35000. We couldn't go all the way to the top because of the snow, and so used narrow trails skirting the highest peaks to the north. There are two tunnels along this path, roughly hewn into the rock and sometimes quite narrow and low. The picture at the right shows the exit from the second tunnel directly leading down a narrow single trail. After a while, this path merges with the other route to climb Monte Tremalzo, the one that went directly south before Lago di Ledro. There are several different routes down Monte Tremalzo. The picture at the right shows a view after a bend in a moderately steep forest path, with a view over one of the valleys to the east of Monte Tremalzo. The trouble with descending too far south is that the only way back to Riva is the busy road along the edge of Lake Garda. Since there are numerous small tunnels on this road, a taillight or an LED flasher are essential. Italian drivers are not known for their careful slow speeds. At another occasion, we rode down a trail that was marked with a dashed line on the map (dotted in the map in this page), meaning ``steep hiking trail, mostly marked''. We thought this was a competition trail, but I don't believe it. 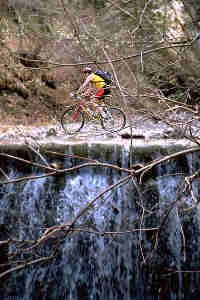 It was so steep and dangerous that we had to carry the bicycles much of the time, or detour when possible. Generally, when a map of the Alps uses a special pattern to denote ``steep'' or ``difficult'', they really mean it. Here is a picture of out bungalow in Riva. 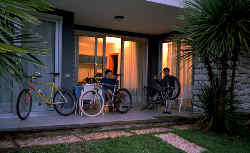 The really nice thing about a bungalow is that it's easy to bring the bicycles in without any trouble and that there is a front porch for repairs. 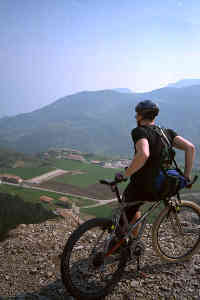 Serious rides in a place like Monte Tremalzo will inevitably cause minor damage to the bikes (in our case our Master Bicycle Part Destroyer totalled an AMP suspension fork), and the bicyle will need cleaning. Not that we care much about a sparkling clean frame, but chains and bearings need lubrication. I don't know how we would have managed in a small room on the fifth floor of some regular hotel.